Find out about the latest press for Barefoot Tess. Here’s a great review of our Steve Madden ‘Tailor‘ flat in neon purple by Wendy on her fantastic blog Feet Not Petite. Take a look! We think it’s important to let you know what goes on behind the scenes at Barefoot Tess. We’ve got a fabulous group of dynamic, stylish women keeping it all together! Every few weeks, we’ll be bringing you a new team member interview and profile. PLUS, get a chance to win the pair of Barefoot Tess brand shoes picked by each team member as their favorite! To enter, share the interview on your Facebook page, then drop us a note on ours with the name of the Barefoot Tess shoe picked as the current team member’s favorite (don’t forget to “like” our page!). Winners will be selected at random by Saturday, January 12, 2012. 1. What made you decide to start Barefoot Tess? When she was growing up, my youngest daughter Tess always wore a larger shoe size than her peers or sister. It was frustrating for both of us, and impossible to find her shoes that fit properly. The best analogy I can think of is that, for her, it must have felt like trying to go bathing suit shopping if you’re terribly overweight. The same feelings of guilt, shame, and frustration apply. We would go to stores together (particularly Nordstrom because they claimed to carry some larger sizes). But as it is with teenagers, she wanted the shoes her friends had and wore to school, and Nordstrom would invariably disappoint. Naturally they had the shoes she wanted, but never in her size. Their selection of larger size shoes was boring, uninspired, and not trendy; the opposite of what might suit the needs of a trendy, teenage girl. On those trips and during this time period, I realized that there was a niche market for fashionable, trendy shoes in larger sizes, and that no one was filling it. At that time, I didn’t even realize just how broad the niche really was. Once we started the business, I fathomed just how many women actually wear larger sizes (by the way, I categorize a “larger” shoe size as anything above a 10). It remains difficult to get the shoes we want made in larger sizes, insofar as vendors and department stores are totally focused on getting the most return for their investment, and although larger sizes are a much more common niche than we had originally realized, they remain an outlier, so oftentimes, companies and factories are still unwilling to make them. We frequently get our orders cancelled. However, we refuse to give up and are tenacious to the point of ferocity about having the kind of shoes that we want to sell made for us. Part of the challenge for us is that we are required to purchase such large volumes of a style of shoe that we want to sell that we just can’t always get all the styles we want from a particular vendor. Some vendors limit the styles we can choose from within their brands. This is a big part of the reason why we started our own line; it allows us to be in control of the styles, and permits us to choose what we want. 2. What’s one major misconception the fashion industry has about women who wear larger shoe sizes? I think the fashion industry continues to underestimate the size of our customer base. Shoe sizes have changed from an average of a size 5 at the turn of the century to today’s average of a size 9, which means that a size 11 is statistically the same distance from the average as a size 7. Additionally, the one really common thread among women who wear larger shoe sizes is height (typically, if you wear a size 10 or above, you’re going to be tall). You’d think the fashion industry (an industry that is not only replete with tall women, but which actually seeks out, emphasizes and encourages height) would pay attention to that. 3. What new trends are going to be huge for Spring 2013? The hidden wedge sneaker is a huge new trend, and we’re so thrilled to be getting these made for us. The technology involved in having these made has been really challenging; we tried for 6 months before we finally found a great factory capable of handling the task in Brazil. Flats are also going to be huge (but not necessarily ballet flats). This spring, the “new” flat has a ½ inch square heel. While the pure ballet flat is still wonderful, the new trend is to have something a bit sturdier and with more structure. The cap-toe is a huge trend, studs are still around, huaraches, as are wedges in general, and there’s a new kind of pump for spring. In the last 4 years, the only pumps women would wear were serious platforms. That trend is on its way out and is being replaced by a trend that’s actually a throwback to the mid 1990’s: the slightly pointed-toe pump with no platform and a 3-4” heel. Look back at magazine or runway shot from 1995 and that’s all you’ll see. 4. Any new designers you’re working with? What can we expect from Barefoot Tess in the future? Yes, we’re bringing in a few new designers for spring 2013. We’re incredibly excited about our own new collection that’s being made in Brazil, as well as Diba (also made in Brazil, but developed in Italy and designed by the Dutch), and we’re thrilled about a new line called Aspiga. They’re beautifully beaded sandals that are designed in the UK but actually hand-made in Africa and India. The beauty of working with this company is that they create jobs for local men and women and provide revenue for local communities. We’re also getting some really cool beaded mocs and dock siders from a company called 2568 shoes. I think they’re going to be a huge hit! 5. Which Barefoot Tess shoe is currently your favorite? I’d have to pick the “Juneau” boot from the Barefoot Tess collection. It’s available in black and brown and I adore it because it seamlessly blends the motorcycle trend with a feminine touch and has the most amazing, super soft faux fur lining. I wear mine with everything from jeans to silk trousers to tights and A-line skirts. It’s really the perfect winter boot. 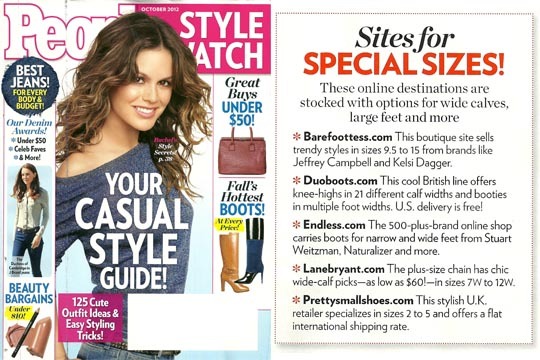 BFT in People Style Watch October 2012!